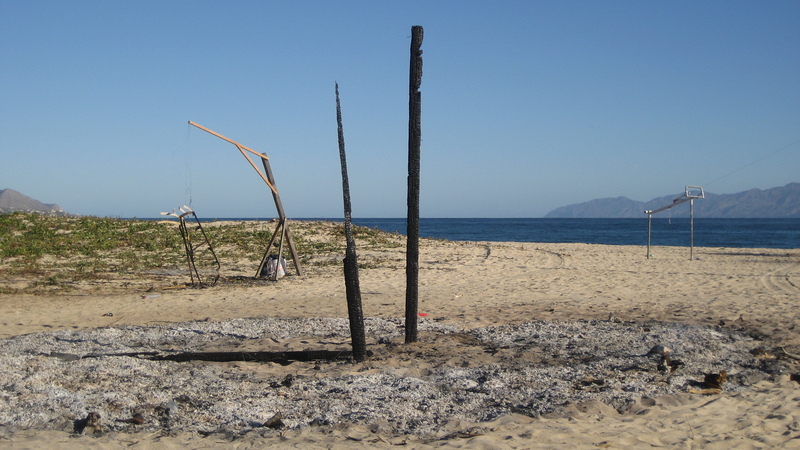 Saturday evening and we were in La Ventana for the big party that is Burning Bush, the Baja Burning Man knockoff where people go crazy with fire for one drunken, drunken night on the beach. We rented a car with our friends Dan, Drew and Miya, got some beer and some gummy bears and stubbornly decided to have a good time. As we were walking from the car to the beach we passed a group of kids toying with a laser. I was going to describe Drew and Miya as the Swiss Army Knife of couples, but I actually think they’re more like the high-tech Leatherman of couples, made out of H1 steel that won’t rust and comes complete with wifi and a laser that you best believe is more than 1000 milliwatts. They live on a 37′ trimaran, Tie Fighter, which is as streamlined and as efficient as they are, and they sailed all the way from Vancouver. They take their fun very seriously. I say this in part because Drew told me so, partly because they rigged a sweet party pool/platform in between their amas to avoid the draining heat of summer, and also because they have not one, not two, but three boxes filled with costumes (most made professionally by Miya), presumably for emergencies like Burning Bush, which was lucky for us because our ‘costume collection’ consists of one very interestingly shaped hat that Debbie brought back from Peru. We had no idea what to expect from Burning Bush. 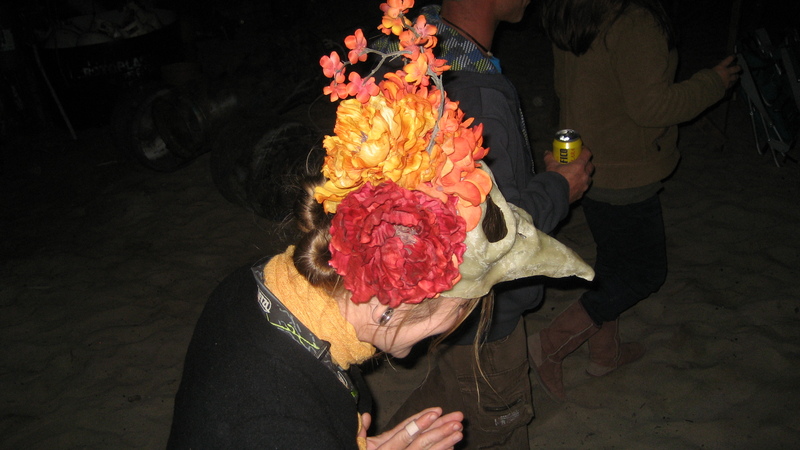 We knew that it was the third or fourth year that the folks down in La Ventana had put this on and that our friend Jack went last year and said it was the best time he’d ever had, but I think that it was the first time Jack had ever done ecstasy, so I don’t know how seriously we should take his testimony. La Ventana is a sleepy summer town and in the winter a kite boarding/windsurfing mecca, so who knew who was going to show up. We certainly didn’t know anyone else who was going. Early on, Miya used a word that would come to define the entire night: lawlessness. As soon as we arrived Drew located Bruce, the man in charge, to confirm whether or not he’d be performing. It was clear that Bruce either had a lot on his mind or was just super stoned because he could only give vague answers to our questions about where to camp. He did tell us not to camp in the hills right next to the ‘stage’ however, and mumbled something about gasoline bombs. Gasoline bombs! And sure enough, we were treated to four beautiful, black, billowing mushroom clouds later in the evening, so awe-inspiring that for one fleeting second I actually sympathized with Michael Bay. And the safety precautions? One man yelling ‘Get off the hill!’ a few minutes before the explosion. 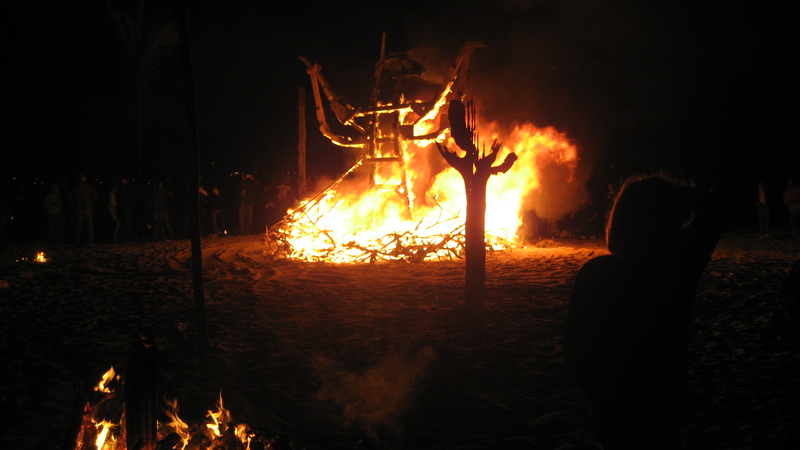 There must have been about six or seven bonfires that were lit consecutively throughout the course of the night; the grand finale was the largest, dressed to look like a volcano and made up of old christmas trees. The heat generated from the big bonfire was so intense that the large crowd surrounding it was immediately forced back fifty feet. There were people shooting off fireworks, and we had both sober firedancers and drunk firedancers (she almost ended up in the fire). 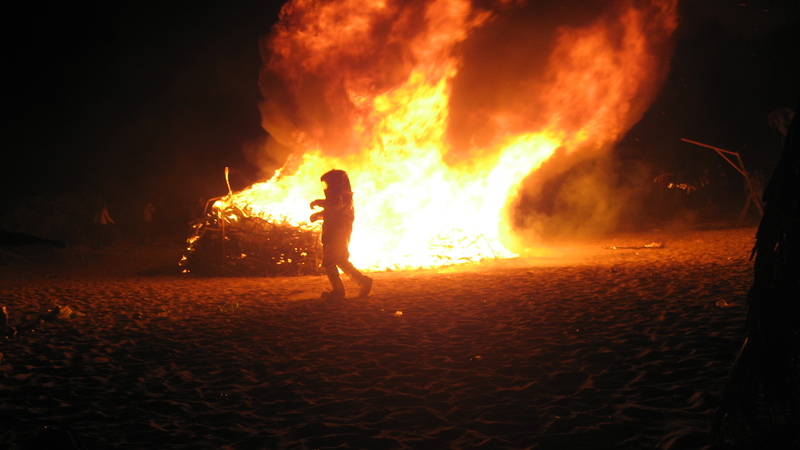 At one point a man on an ATV with a flame thrower attached to the back made to light one of the bonfires; he was having some trouble and ended up having to circle the bonfire a couple of times and we are still unsure whether or not he ran over an old man in the process. 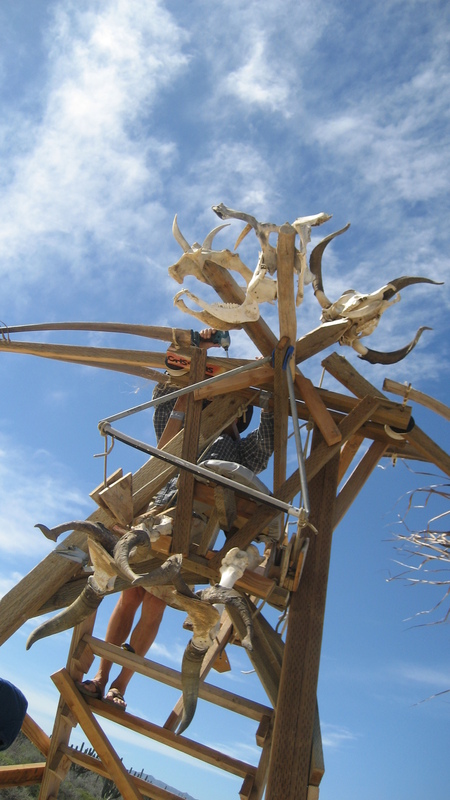 There were also all these crazy pterodactyl sculptures all over the place. Many were hooked up to a propane tank and had small flames burning permanently by their skulls. Every now and then someone would walk round with a ipad and electronically open the valves on the propane tanks, resulting in big bursts of flames coming from the mouths of the gargoyle-like figures. Drew played an impressive set. The week leading up to Burning Bush he recorded a menagerie of sounds and then mixed them live into ten songs, giving the audience a once-off performance that delighted the crowd. Drew was surrounded the entire time by a gaggle of young, Mexican teenagers admiring his skills – if it unnerved him it didn’t show in the music. He stopped playing in the early hours, and soon after I began to fade quickly. Since Michael and I abide by a strict buddy system when we are in large crowds he was obliged to come with me, and we stumbled back to our temporary beach front property (tent), curled up and passed out. A couple of hours later, and the big bonfire was still smouldering. Of the four two-by-fours that were the structural supports for the volcano, two or three were still standing, gently burning hot and black and irresistibly upright. Drew found their uprightness particularly offensive and tried to persuade Miya to jump-kick the supports to knock them down. Miya was hesitant, not because of the danger but because she didn’t think she could pull off a jump-kick in a tutu, so Drew stepped up to the plate and within the hour they were on their way to the Emergency Room. Drew had gotten an ember stuck in his boot in his spectacular jump-kick attempt, and the ember had quietly and quickly burned a lime-sized patch of skin to the point where Drew could no longer feel any pain. Lawlessness, indeed. So Burning Bush was a success, and in other news I both flooded the restaurant and electrocuted the crap out of myself trying to do laundry so I really can’t make fun of Rosie anymore. That stupid washing machine has made so many attempts on my life but nothing scares my more than the deep fat fryer. The Shack is a magnet for weird, slightly dangerous things (only here is the phrase ‘silver chalice with the pig jaw’ a totally acceptable thing to say) and the death-fryer is one of them. It makes sounds like two Tasmanian devils getting bulldozed to death when it is on and even though Michael claims he’s never been burned by it, I just know it’s waiting for the first opportunity to take all the hair on my arms off. We took a trip down memory lane with Travis the other day when he pulled out an old box full of photographs from some forgotten corner. As we started to pass around some fantastic pictures of young Travis with bleached blond hair, he got a mildly concerned look on his face. We got to meet some of the many boats Travis has owned. My personal favorite was the boat named Gspot, with a hailing port of Earth. We also saw many scenes from Travis’ past life as a rodeo clown; pulling up the pictures must have given Travis a touch of nostalgia. So that’s it, we’re still alive and the boat is still floating – and now with a wind generator! I’m a true fan of the buddy system – keep that in place and enjoy the rest! !